Goth Shopaholic: Gorgeous Lace and Velvet Cape Meant for Halloween - Bet You'll Love It! Gorgeous Lace and Velvet Cape Meant for Halloween - Bet You'll Love It! You can add quite a sinister look by wearing this velvet and skull mesh cape! I would love to wear this every day if it was possible! 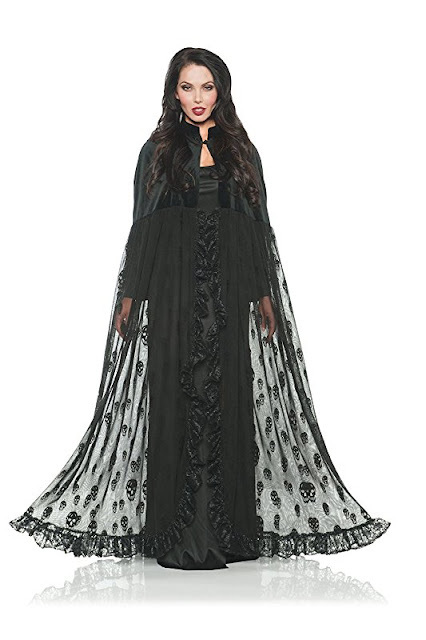 The velvet and skull mesh cape is necessary for a mistress of death. A malevolent witch or even necromancer would love to wear something so ominous and creepy! Don't you wish you could wander around a graveyard summoning the undead wearing this? Comment below and tell me what you think! It is so tempting!